We were incredibly honored to host and enjoy the company of some of the most talented culinary minds in the World! On February 4th, great chefs, master mixologists, and other enthusiasts joined us at the Maui Tropical Plantation for a tour of Kumu Farms and a delicious meal by The Mill House Restaurant. 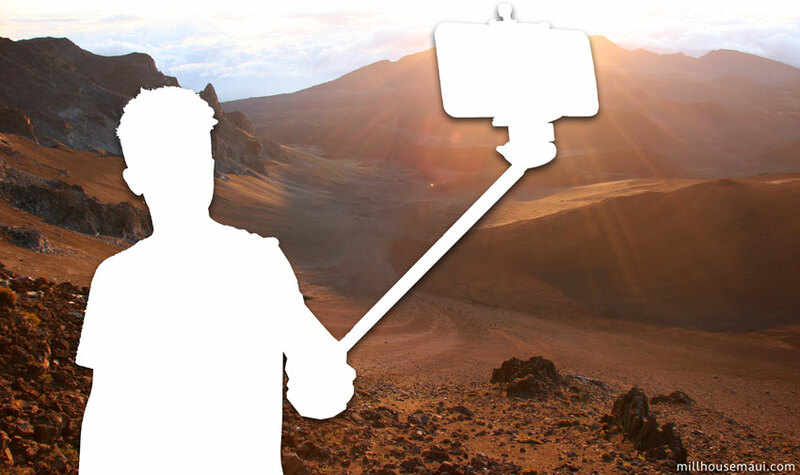 If you haven't seen the latest craze of selfie sticks, you haven't been going to the coolest selfie spots on Maui! While everyone wants an epic selfie while on vacation in paradise, you want to make sure your backdrop is as jaw dropping as your coiffed hairdo. Check out these 10 Best Selfie Spots on Maui! 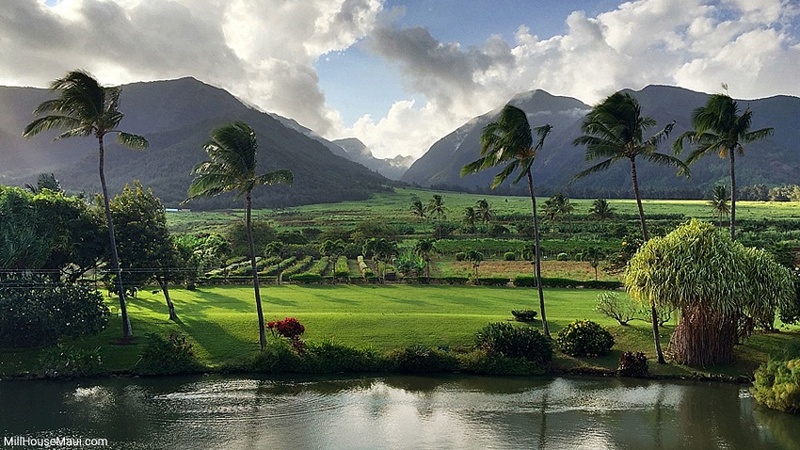 One of the best views of the Waikapu Valley is found at Maui's favorite hot spot, the Mill House Restaurant. Grab a spot with a view of the lagoon, and you'll be front and center to one of the best views on the island. And this valley has a fantastic legend, which gives you another reason to snag a picture. According to the legend, there was a lava tube that extended from the Waikapu Valley all the way to the other side of the island. There was a Pu, (conch shell trumpet) that if angled just so, the trumpet could be heard for miles. Naturally, this gained some attention, and a prophet from Kauai journeyed to Maui in search of this magical Pu. However, as any good legend has, there was a mischievous dog named "Puapualenalena" who lived at the entrance of the lava tubes and quickly hid the shell. While the shell is now silenced, Maui still retains bragging rights of keeping the Pu on our island! Seattle may have the Space Needle, but Maui is home to its own needle. 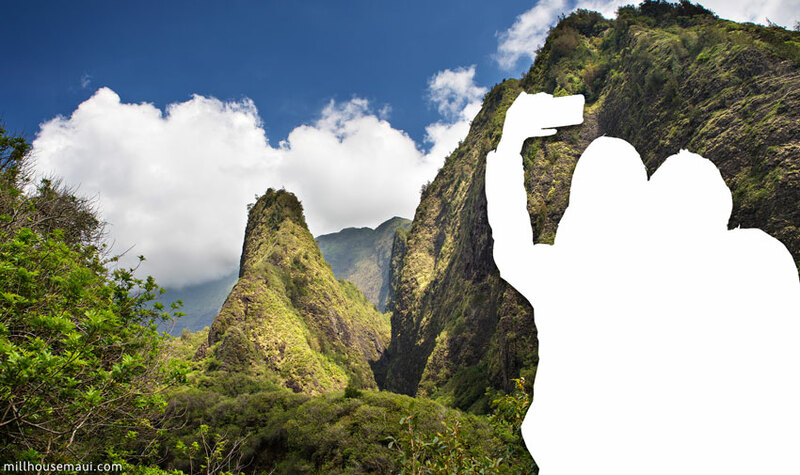 Tucked into the lush greenery of the Iao Valley, selfie spot #2 isn't hard to miss. This gorgeously green needle-like mountain stands 2,250 feet above sea level. And if you want a little history to go along with your picture, this spot is known as one of the most historic battles on Maui. King Kamehameha fought against the Maui army in 1790 with the intention of conquering and gaining control of Maui. He wanted to join the Hawaiian Islands under one ruler. Don't be surprised if a ghost or two photobombs your selfie! Thanks to the invention of the GoPro, you can catch your Kodak moments while riding one of Maui's ever-exciting waves. First time surfers will find their perfect selfie wave in Kihei or Lahaina, where the breaks are small and manageable. These waves don't eat tourist like some of the breaks on the North Shore. And the locals are happy to share these spots. If you think you've got what it takes to hang with the big boys, you can try Ho'okipa. However, respect the fact that the locals and better surfers always get the right of way. You may be adding a black eye to your selfie if you step on the wrong toes! You'll be taking plenty of beach and poolside selfies, which makes this spot a breath of fresh air. Being the only real downtown on the island, this salty sea town has character and history that makes for a well-rounded selfie. What started as a Pacific whaling port as become the hub for great restaurants, fun bars and an actual nightlife! If you hadn't noticed, Maui isn't one to stay up late. Which makes the bustling Lahaina even more popular if you feel like staying up past 8:00 pm. Selfie set ups are usually in front of the famous Banyan Tree. What looks like a dozen trees is actually one 8 foot tree brought over from India and planted in 1873. This Banyan Tree has a dozen main trunks and covers about one acre. Other popular selfie spots are the rooftop lounge at Fleetwood's on Front Street, the harbor with the cruise ships bobbing in the distance or the ever popular Halloween on Front Street. If you don't have the money to take a rocket ship to the moon, the Haleakala Crater is the next best thing. If you can drag yourself out of bed early enough, watching the sunset from the top of this crater is otherworldly. Granted, your selfie may look like a sleep-deprived Chewbacca, but the backdrop will be so beautiful, you won't care. Sunset is also a stunner up here, so if your selfie matters more than the location, this would be your time slot. No matter when you go, your breath will be taken away by this gorgeous location. Looking for the world's best photo bombers? Look no further than these gentle giants. No one seems to complain when a humpback whale decides to breech while you're selfie snapping. In the winter months, Maui is known for being the whales playground, and you might end up taking more pictures of their antics than of yourself! Well-worth the windblown hair look when you get to see the magic of whale season! Nothing beats a selfie from 50 feet above the ground as you zip through the rainforest. Maui Zipline offers a ride the whole family can take a selfie on, and that adrenaline rush makes for some very fun faces! With views of the island and rainforest, these selfies will definitely make it into your vacation scrapbook. There are certain things that can only be seen from the sky, and if you want your face next to a 1,000 foot waterfall without drowning, a helicopter tour is the way to go. These tours take you where very few selfies has ever gone, making you the coolest kid on the block. Oh, and you get to see some incredible views, from pristine coastlines to hidden rainforest valleys and historical landmarks. Selfie heaven! We can thank GoPro again for making their cameras water friendly. Snorkeling in Maui is rad, snorkeling with tropical fish is even better, but snorkeling with giant green Hawaiian sea turtles is the best! Sharing a selfie with these fellows makes for some lovely vacation memories. You probably won't be the only one taking selfies at these spots, but for good reason. Hana has bragging rights to some of the most magnificent waterfalls, and they're just waiting for you and your selfie stick! Check out the roadtohana.com if you want to check out a great guide to all things enchanting in Hana. Waterfalls are a dime a dozen in the lush rainforest, so take your pick and strike a pose! With these backdrops, you will definitely be stepping up your selfie game! Now get out there and start snapping! What are some other great Maui Selfie spots? Comment below! All photography was either taken by Mill House staff, from owners that have given us written permission, and/or purchased for use. We have all the rights necessary to use these images on our website. 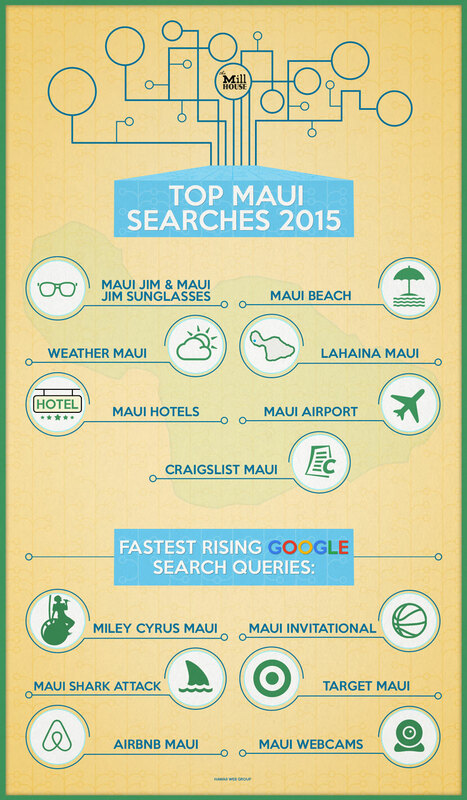 Want to know the most researched Maui topics of 2015? We've compiled a list of the top trending Google topics about Maui, including valuable answers to the most common questions that are sure to shorten your research time. Enjoy, and we look forward to giving you more great information in 2016! What once was a small beachside business in Lahaina has now grown to be one of the most popular sunglass brands in the world. 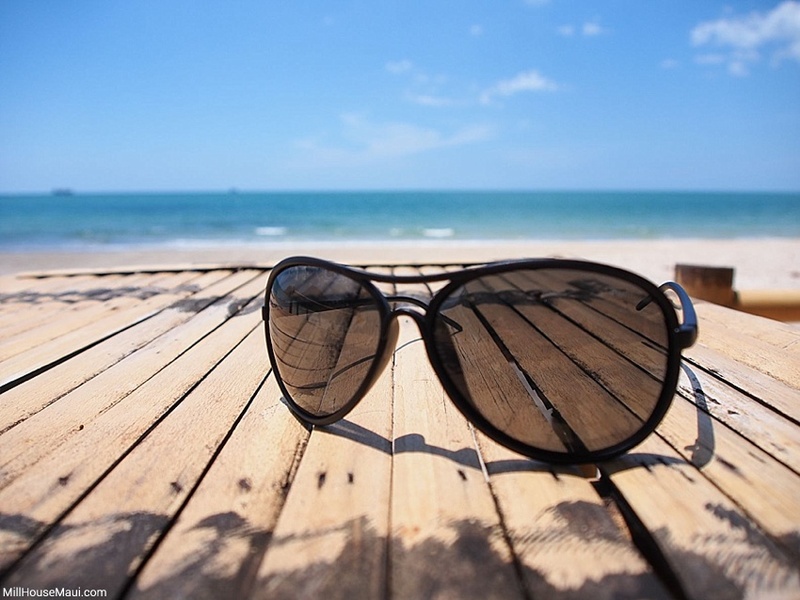 With more than 125 varieties of glasses, all of which are polarized to give you the best, most vibrant views of paradise, the best place to wear a pair of Maui Jims is in indeed, Maui itself. If you're looking to grab a pair during your next vacation, it's a little known fact that Costco has some of the best prices around, though there are several retailers that offer a wide selection. And should you damage them whilst frolicking in the waves, under waterfalls or trekking through a volcanic crater, they also have one of the best warranty agreements around. Everything you've heard is true. Maui does have beaches! However, anyone Googling 'Maui Beach' is probably either seeking temporary electronic teleportation from their daily 3pm Excel spreadsheet duties or wondering which beach is the best for their upcoming trip to The Valley Isle. For purposes of this post, we'll pretend it's the latter. 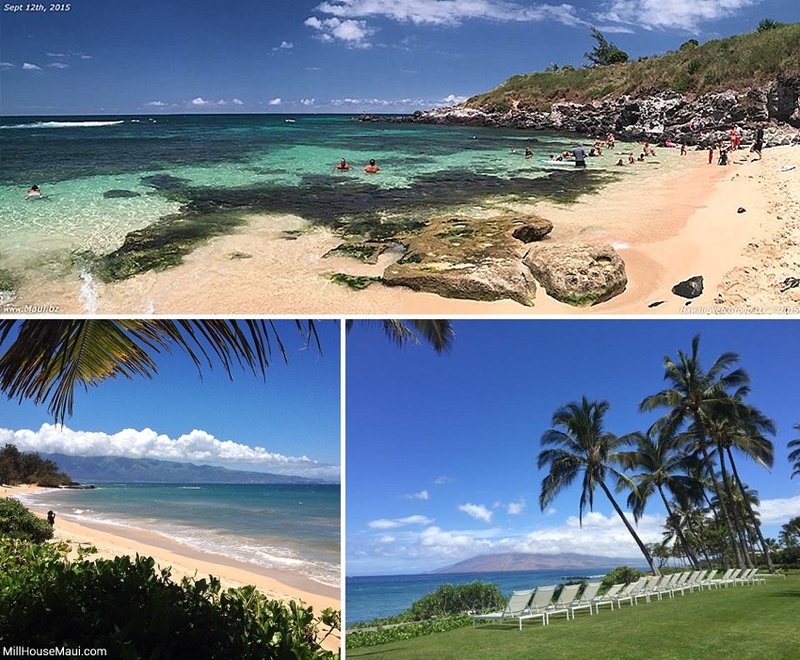 Below we've listed our two favorite beaches in each area of the island, and we hope you get the opportunity to discover your very own dream-worthy Maui beach. In a word, weather on Maui = nice. With average annual temperatures between 65 and 86 degrees Fahrenheit, chances are you'll experience somewhere between perfect and near-perfect conditions the majority of the time you're here. Because Maui has so many microclimates, the weather greatly depends on which area of the island you're in. Leeward areas like South and West Maui experience the hottest temperatures and least amount of rain, while the Central Valley and windward areas of Haiku and East Maui experience much heavier rainfall and lush, jungle-like conditions. For those seeking a break from the heat, simply head Upcountry to enjoy cool breezes and scenic panoramic views, or the 10,000 foot summit of Haleakala, where temperatures regularly dip below 45 degrees. Formerly the capital of the Kingdom of Hawaii, Lahaina Town is currently one of Hawaii's most popular destinations. Lahaina's famed Front Street, named one of America's 'Top 10 Greatest Streets', offers an assortment of boutique shops, historical artifacts and attractions, oceanfront restaurants, live music, art galleries, the amazing Banyan Tree Park, and scenic sunset views. Though any day of the year draws a crowd, the most memorable way to experience Lahaina is during the annual Front Street Halloween Party, which attracts more than 25,000 attendees from around the world. Visit Lahaina Town for a more in-depth look at the best activities, beaches, dining and accommodation options. Accommodations are a major part of any vacation. Luckily, Maui's huge variety of options, from penthouse to tree house, will delight even the most particular travelers. For those looking to splurge, we love the oceanfront Four Seasons Resort in Wailea, secluded Travaasa Resort in Hana, and Ritz Carlton Kapalua, though there are no shortage of stunning luxury accommodations. Our favorite midrange options include the charming Iao Valley Inn in Central Maui, Nalu Kai Lodge in Paia Town, The Ilikahi in Lahaina, and Maui Sunseeker LGBT Resort or Tracy's Tropical Treasures in Kihei. For backpackers or those on a tight budget, we recommend the Aloha Surf Hostel in Paia or any of the amazing campsites on Maui! 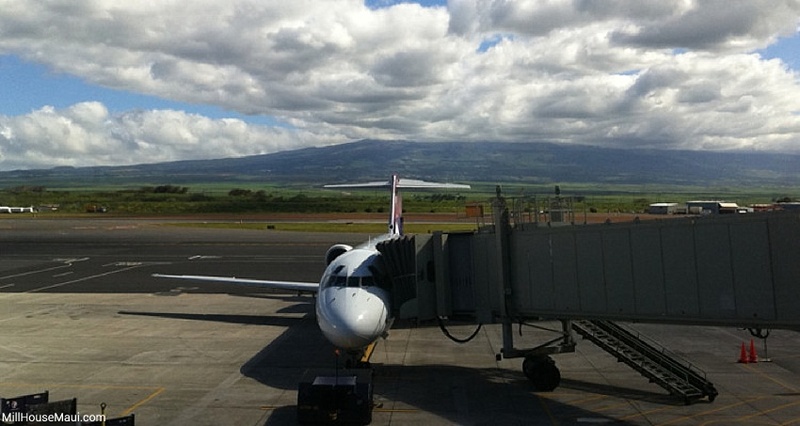 Kahului Airport (OGG) is Maui's major airport, located conveniently in Central Maui. Two others, Kapalua Airport and Hana Airport, are typically used in moderation for inter-island flights. Chances are you won't be spending much time here, so get in, get out, and enjoy yourself as much as possible in between. For more information, please visit Maui Airport Map and Maui Car Rentals. Oh, Craigslist. For those visiting Maui, you probably won't find much use for it outside of searching for garage sales to stock up on inexpensive beach gear. For those who live on Maui or are planning on moving, it's unfortunately and fortunately one of the best (and only) places to find a place to live, someone to live with, and a job. Competition for housing is fierce and goes quickly, so keep your eyes peeled and your vehicle ready. Like anywhere else, Craigslist on Maui is a popular catch-all for buying and selling. Just use it with caution. She came, she swam, she took her top off. If you think that's interesting, Little Beach on Sundays might just make your head (and eyeballs) explode. An annual event since 1984, the Maui Invitational is an early season college basketball tournament held over Thanksgiving week at the Lahaina Civic Center in West Maui. Previously sponsored by EA Sports, 2015 was the first year the event was sponsored by Maui's own Maui Jim. Attracting more than 4,000 visitors, from journalists, athletes, officials and event sponsors, the Maui Invitational consists of 8 teams, made up of the host school, Chaminade University of Honolulu, as well as a team from each of the six major conferences and one from a different conference. The event has been a success in boosting Maui's economy, and continues to draw national attention thanks to coverage from ESPN. First of all, the chances of you actually encountering a shark on Maui, especially an aggressive breed like a tiger or hammerhead shark, are extremely low. In fact, you're 30 times more likely to be injured by a falling coconut than a shark. The best ocean safety tips to practice during your trip is to never swim alone or near anyone who is fishing. Also avoid swimming in murky conditions, typically caused by a storm or nearby runoff. Maui is a wonderful place to experience the beauty of the Pacific Ocean, so don't let a few cases of mistaken identity (out of the thousands of people who swim here daily) let it affect your trip. One of the newest additions to Maui was the immensely popular retail chain, Target, which officially opened on March 4th, 2015 in Kahului, Maui. While other stores like Kmart and Walmart have locations nearby, many residents and visitors were excited to welcome Target to the island for its variety of affordable home goods, electronics, clothing, groceries and more. First founded in 2008, Airbnb has quickly grown to be one of the most popular resources for accommodations in the world, now with upwards of 1.5 million listings in more than 190 countries worldwide. On Maui, Airbnb is quickly becoming one of the best ways to find accommodation outside of expensive resorts, offering a huge variety of options, from cozy studio rooms in the rainforest of Hana to sprawling, multi-bedroom estates in Upcountry Maui. Filter options by date, room type, price range, amenities, neighborhood and much more criteria to find your perfect rental in paradise. When an island is this beautiful, it only makes sense that people want to see it as often as possible. Enter Maui Webcams, conveniently located in several of the island's most scenic areas, including Maui Tropical Plantation, Paia Bay, Ka'anapali Beach, Makena Beach Golf Resort and more, all for your real-time viewing pleasure. We hope this list offers some useful information for your next trip to Maui, and as always, mahalo for reading! Respond below with your questions about Maui and we'd love to help you answer them. Aloha! With the technology of drones, many people are able to capture their vacation from a high bird's eye perspective without having to spend money on helicopter rides. You may have seen these drones buzzing around, but have you seen the result of the captured aerial photography of these machines? Some of these images captured of Maui are absolutely breathtaking. We have handpicked 26 beautiful photographs contributed by local drone photographers around Maui. The canoe crew of the Beach Club at Andaz Maui Wailea Resort practicing in the morning. The crystal clear waters show the different shades of blue coral at Ulua Beach in Wailea. Photo by Randy Jay Braun Photography. Olowalu, also known as Turtle Reef, is home to one of the most magnificent coral reef systems in Maui. Located just 4 miles south of Lahaina, the strip of beach is small, but one of the best snorkeling spots in Maui. You can swim past walls and walls of endless coral reefs to view various tropical marine creatures thriving in this coral. Photo by Russell Hanson of EpiCapture Productions. Maui Tropical Plantation is about to launch a project that will blow your mind! The first "Drone to Table" of Maui will provide freshly picked organic vegetables via drone directly to restaurants. A part of Maui Tropical Plantation's property is operated by Kumu Farms, which grows and produces organic seasonal fruits and vegetables. 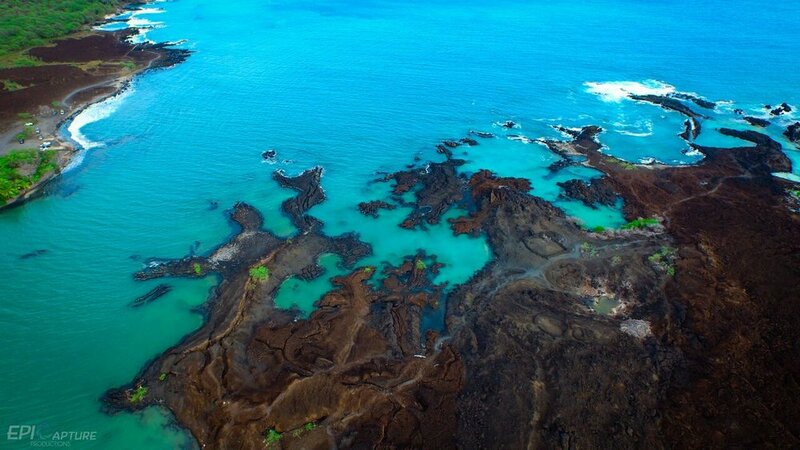 La Perouse is known for its great snorkeling and its rocky lava landscape. The lava rocks feature numerous small coves that offer good visibility for snorkeling. The bay itself is does not have the best visibility. When we think of Hawaii's landscape, we think of relaxing beaches, luscious greenery, and the crater or volcano that make up the island. But did you know that most of Maui's land is covered in sugar cane that produce raw and specialty sugar? Photographer Randy Jay Braun captured a beautiful sunset overlooking the sugarcane field, with no structure in sight, which is representative of Maui’s natural beauty. Kumu Farms grows organic vegetables on the property of Maui Tropical Plantation. The variety of produce is sold at their Farmer's Market, open Tuesday-Saturday from 10 am to 4 pm. The newest project that Kumu Farms will be starting is the "drone to table" delivery service. The freshly picked produce will be delivered from farm to table by a drone, ensuring your delicious lunch and dinner served with fresh vegetables picked 20 minutes prior. With a long stretch of sandy white beach, this is a perfect spot to bring your family, and even your dog. A scenic path through a forest follows the shoreline. The best time to visit is in early mornings, before the wind picks up in the afternoon. During the winter, the water is rough, often with big waves, but you will still see local kids used to the conditions enjoying body boarding and boogie boarding. Baldwin Beach is just a 2-minute drive or 10-minute walk from the town of Paia. Ample parking and bathroom facilities. Photo by Blue Hawaiian Helicopters. Manawainui Gulch is one of the driest parts of Maui, with “crispy” landscape tones of yellow and light and dark brown. Even though it is located right next to the ocean, this part of the land does not get much rain or humidity. Historially, Manawainui Gulch was filled with flowing fresh water, giving life to the surrounding land areas with its tall koa and sandalwood trees. Old Hawaiian families used to thrive in this back-end of Hana when water flowed freely. Even without the water flow (and only the rare flash flood), the gulch still has its charm, expertly captured in this photograph. The photograph was captured by Randy Jay Braun Photography. Old Maui High was the island’s first co-educational school. It opened in 1913. By 1939, the number of students had reached over 1000, and school life was thriving with student clubs, activities, and athletic groups. After Baldwin High School and Maui High School opened, the number of students declined and Old Maui High closed its doors in 1972. Today, a group of alumni and construction specialists all volunteer their time to preserve Old Maui High. It still stands strong, symbolizing a community's values, aspiring students' dreams from hard-working families of nearby sugarcane fields, and the many accomplishments achieved from its thousands of alumni. Photo by Justin Edwards of DroneAbove.com. Captain Mike sails Shadowfax Yacht for private snorkeling or whale watching excursions. This 44-foot-long yacht has all the cozy amenities inside the cabin. The Shadowfax floats gently on the turquoise water of Maui while people enjoy snorkeling nearby. Located on the North Shore of Maui, Ho'okipa is a world-renowned windsurfing spot. During the winter when the waves are big, you are likely to see many windsurfers and if you're lucky you may run across a windsurfing competition. On many summer days when the water is calm, you can enjoy the sea turtles that nestle up on the shore, have a BBQ on the beach, or watch young surfers enjoy their time in the water. Looks like Maui Fun Charters had a non-windy day aboard The Majorie Ann, a 36-foot-long fishing boat that offers Bottom Fishing Tours. Not a single ripple can be seen in the calm ocean, with a picturesque landscape of West Maui Mountains. Photo by Hawaii Web Group. You can see that Hana is truly remote from the rest of Maui—truly a quiet and secluded place. The photo captured Travaasa Hana, a tropical resort sanctuary that offers many activities such as spa & wellness treatments, plus adventure, fitness, cultural, and culinary experience. Honomanu Bay is one of the beaches located on “The Road to Hana.” Right past mile marker 14, there is a sharp turn that goes on for half a mile and will take you to this beautiful bay surrounded by tropical valleys on both sides. The Waihee Ridge Trail's 4.5-mile round-trip hike takes you through the West Maui Forest Reserve to the magnificent view of the valley and of course the fun ridge-line hiking. This hike is often a “wet” hike, so be prepared to get a little wet and muddy. The waterfalls have plenty of water and the surrounding area are luscious, as you can see in the photo below. When you're in Maui, you have to take a boat ride! You can easily access Molokini Crater from a boat right off Maalaea Harbor. The most common excursions offer snorkeling at the crater. The clarity of the water is usually very clear, unless stormy weather is about. A great snorkeling destination to enjoy various tropical marine creatures. 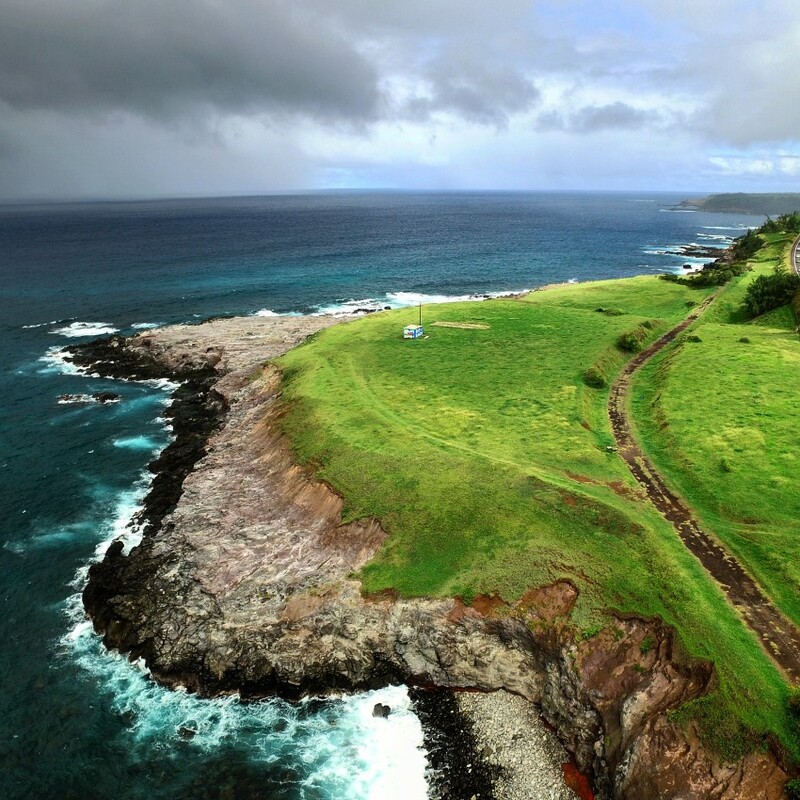 This drone captured the most northern tip of Maui, the rough cliffs of Honolua Bay, and the Kapalua Golf Course. In the distance, you can make out Molokai, a remote 38-mile-long island. If you don't like big cities and traffic, and really want to experience how local Hawaiians live, Molokai is a perfect place for you. This 38-mile-long island has no traffic lights and is known to have the highest sea cliffs in the world. Molokai can be enjoyed in many ways, including such outdoor adventures as snorkeling, drives into the rough with 4-wheel-drive vehicles, hiking, and relaxing on white sandy beaches. Ukumehame Beach Park is located right between Maalaea Harbor and Lahaina. Ukumehame is known as a beginner's surf spot with gentle waves. 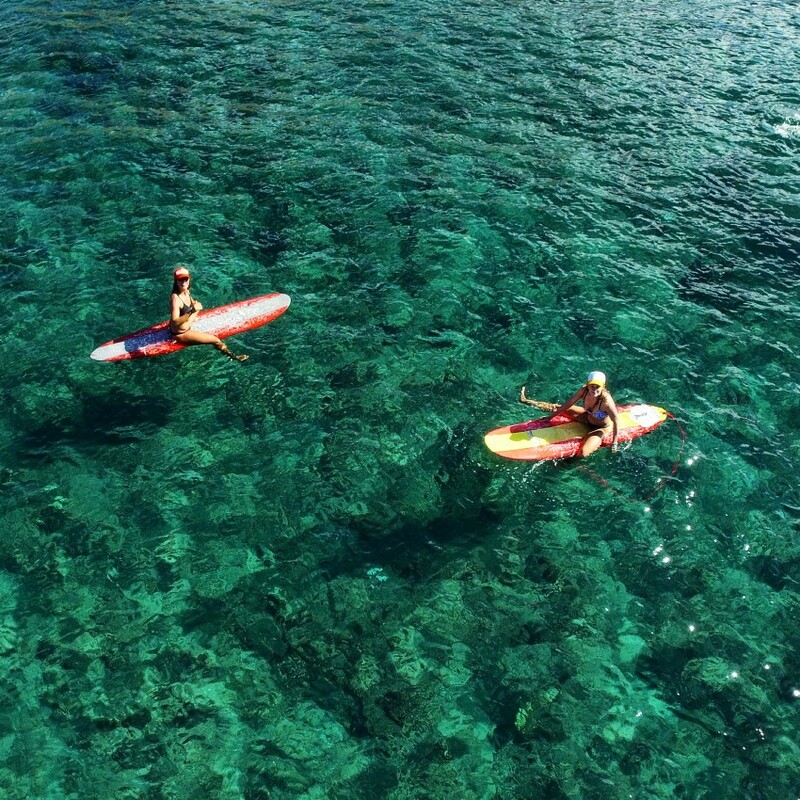 The two girls enjoy a sunny day on their longboards, and you can see the coral beneath them. Watch out for low tide and shallow waters as you don't want to touch the coral. Learn to fall flat on the water, instead of falling feet-first. Lahaina is one of the most bustling cities of Maui. In the 19th century, Lahaina Harbor was the center of the whaling industry. Front Street is lined with touristic shops where you can buy Hawaiian souvenirs, grab a meal, and occasionally attend outdoor concerts or shop in markets at the Banyan Tree Park. Now that we've shared our top aerial photographs of Maui, it's time for you to try your hand at the unique photo opportunities Maui offers. what are your favorite maui aerial photos? comment below!